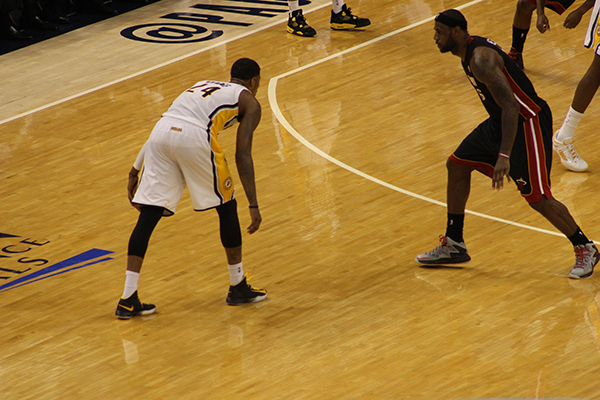 Are the Indiana Pacers Finally Getting to the Miami Heat? The Indiana Pacers are at their best when they’re intimidating their opponents. Their reputation for the league’s best defense and David West are putting the fear into whoever is on the other side of the basketball. Miami, rightfully, isn’t afraid of anyone, and after screaming out to a 3-1 series lead in the Eastern Conference Finals, the Heat looked like a near lock for a repeat trip to the NBA Finals. A victory over Indiana would give them their fourth consecutive trip to basketball’s biggest stage. So they relaxed a little. While the Pacers still almost screwed it up in the closing seconds of the game — when a full-court pass turned into a turnover as well as yet another Rashard Lewis three (Lewis dusted his talent off for Game 5, having been a relative nonfactor throughout the whole year) — they were able to hang on to clinch a victory, forcing a Game 6 in Miami. After three straight games that have involved Miami playing halfway between their peak and neutral, this was the first game that really looked like Miami folded. Prior to Game 4, Shane Battier remarked to Grantland that the 2012 Pacers were the first team to really use the Heat’s aggressive defense against them, a problem that the Heat have largely fixed by playing a more conservative brand of D — that article, a Lowe piece, goes into exhaustive detail and is phenomenal, by the way — but that couldn’t stop the refereeing, who whistled LeBron James for a relatively unprecedented five fouls and limited him to just over 24 minutes of playing time. But was that the cause of his lack of rhythm, or was it Lance Stephenson blowing into his ear? Okay, it’s probably not Lance Stephenson. In the first half of LeBron’s career, it was common knowledge that he could be beaten in the mental game — when he finally hit the next level, best portrayed by his monster ECF Game 6 in 2012, it was a paradigm shift of the highest order. After nine years of losing to Paul Pierce and later Kevin Garnett — two of the league’s greatest trash talkers — James just decided to stop listening. Dwyane Wade, who has had quite the series himself, averaging 21.2 points, four and a half assists, and four rebounds a game, elaborated after Game 4. The Heat, in other words, don’t deign to engage in the quibbling of mere mortals. While the Pacers were able to withstand a 20-10 game from Chris Bosh with some clutch heroics from Paul George and Lance Stephenson, they’re going to have to at least even the series before they can lay claim to winning the war of words.